Hey peeps! It's time for me to get back to this blog and start posting again. I know I know I really need to give some time for my blog and start blogging again. It’s been a crazy week and I’ve been working all day all night (I don’t even have time to maintain my body weight, so…). But today I decided to bring back all my good habits; livin healthy life, being productive both in works and blog, being a friendly one to everyone without snapping everytime everyday, etc. So here I am, it’s midnight here in Jakarta, Saturday night (err.. actually Sunday already), writing a post in front of my laptop in my room, accompanied by ‘Do you go up’ by Khai. My patch sweater brings a lot of attention. 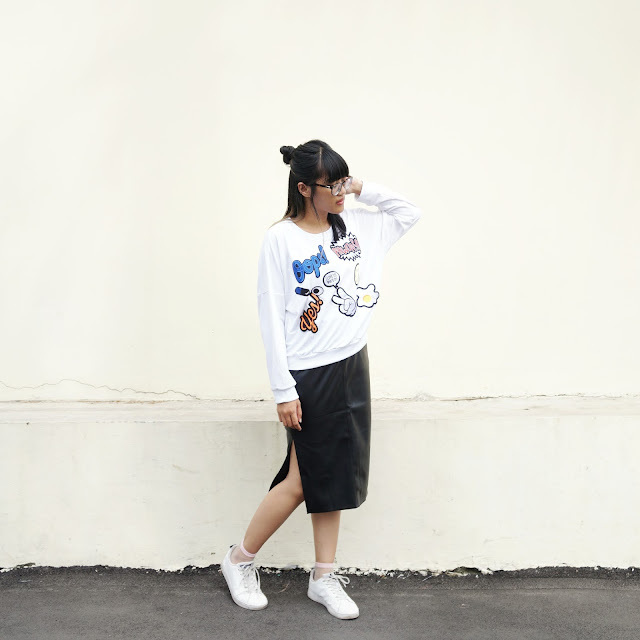 So I toned down a lil bit with black leather skirt, and pairing them with the ultimate good-looking white sneakers. I also wear transparent socks with a pink-list to give more sparks. The point is: if you don’t like being the center of attention, pair your patch item with a bold one, if you can find item with neutral color, the better it is! – But don’t forget. Always be different so I am suggesting you to take out those cute accessories, cute socks, or bags to go along with! Anyway, it’s almost December. Are you up for some gift ideas? Stay tune and I’ll be sharing some of gift ideas next month! See ya, pretty ladies. XOXO, K.